EVERETT, Wash. - The death toll from the mudslide that hit the Washington town of Oso has risen to 39. The Snohomish County medical examiner's office announced two more victims Wednesday and said it was trying to identify three of the bodies. 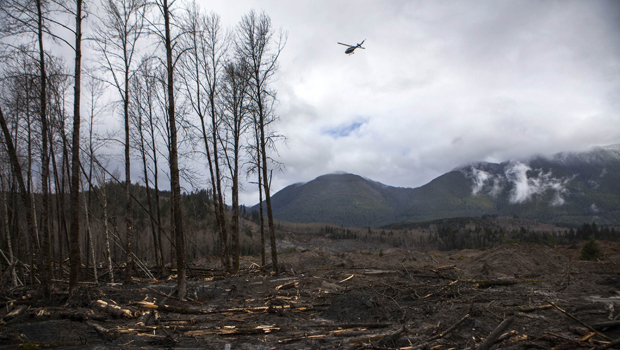 The sheriff's office still lists seven people as missing from the March 22 landslide that raced across the North Fork of the Stillaguamish River and buried dozens of homes in the riverfront community about 55 miles northeast of Seattle. Reopening the highway is a priority for residents facing long detours. It could take one to three months to clear all the mud, trees and other debris, officials told residents at a Monday night meeting. In the meantime, residents may be allowed limited use of a temporary access road that has been restricted to emergency vehicles, officials said.